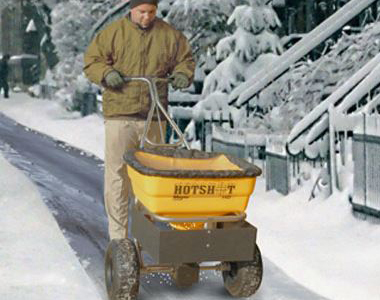 Spread most types of salt, sand, and fertilizer with this Meyer Hotshot 100HD Spreader to get year round use. Carry up to 100 lbs of material in the 1.25 cu. ft. poly hopper for reduced fill up times. Cover up to 18 feet of ground with this spreader that also includes a salt shield to keep material from going in unwanted places. And, 13 inch ice-gripping tires allow you to push this spreader over icy conditions and rough terrain. 100 lb. Capacity: Carry up to 100 lbs. of material with you in the 1.25 cu. ft. poly hopper. Spreader Width: Spread the material at a maximum width of 18 feet to cover as much ground as possible. 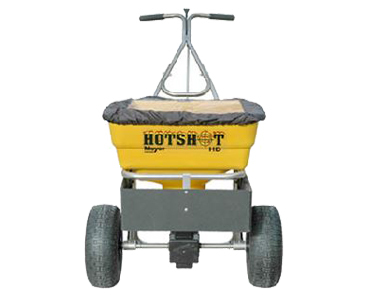 Ask us about the Meyer HotShot 100HD All Season Walk-Behind Broadcast Spreader. Please no repair questions. Your Q&A may be posted to SnowblowersAtJacks.com to help other shoppers, like you, with their purchasing decisions. Thank you.